Gonzalo Higuain is excited by the chance to work again with former Napoli head coach Maurizio Sarri after joining Chelsea. Higuain signed for the Blues on a six-month loan from Juventus on Wednesday, cutting short an unsuccessful spell at AC Milan. Chelsea have the option to extend Higuain's loan for a further season, while the deal with Juve also includes a €36million purchase price. Higuain thrived under Sarri at Napoli, hitting an incredible 36 goals in the 2015-16 season to earn his lucrative move to Juve. And the Argentina striker feels working with Sarri is what he needs, having only scored six goals in 15 Serie A appearances for the Rossoneri. "It was an opportunity that when it presented itself I couldn't miss out on," Higuain told Chelsea's club website. "I'm really excited to be here, to be working with Maurizio Sarri again and to be at a club with so much history. "I'm just really happy to have completed the move and I hope to achieve all the goals which the club has set for itself between now and the end of the season. "I'm someone who is always trying to improve, day after day. I think the most important thing is to be humble, even when we make mistakes, and so when that happens I will always try to rectify that and improve. "For the rest, I'll leave other people to give their opinions on me. I'm not someone who likes to talk too much about myself but I'm someone who tries to improve, and get the best out of myself and my team, at every opportunity." 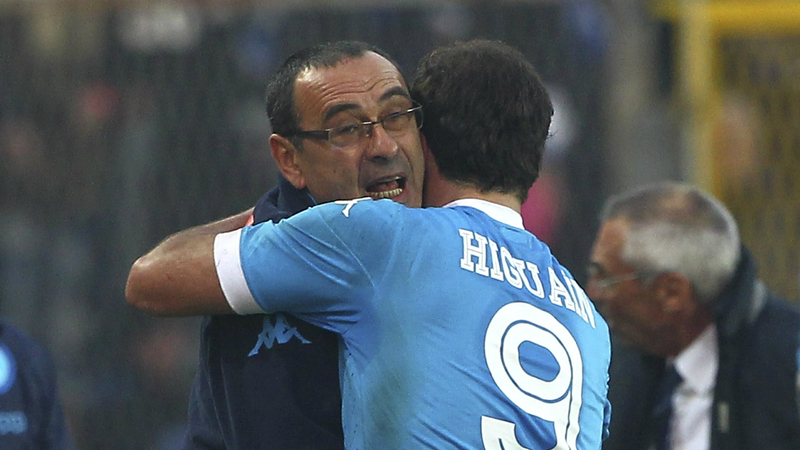 Higuain feels working with Sarri again will enable him to reach the peak of his goalscoring prowess once more. "Maurizio Sarri is the coach who, in my career, has got the best out of me as a player. He's someone who knew how to work with me, particularly on the emotional side," Higuain said. "That year together was fantastic and in big parts thanks to him, so coming to work with him is very important for me. I'm really happy to have been given the opportunity to do that and I want to get back to that level. "It was a wonderful season and one in which I broke the goalscoring record, which is very important out there [in Italy]. It was a fantastic year for myself and Maurizio, and a period which we shared together, even though it was a short time. "Now I'm just happy to be working with him again at a big club like Chelsea which has all the history and wonderful team-mates. I think everything is set on the right path to achieve our goals by the end of the season." Jorginho is another Napoli favourite plying his trade at Stamford Bridge, with Higuain glad to see another familiar face. "It was my best year as a player and he's a wonderful midfielder who contributed to that," he said of the midfielder. "He's also a very good friend of mine so it's a real pleasure to once more be joining up with him, and I hope we can achieve great things together again."